I really like the width of this nightstand. 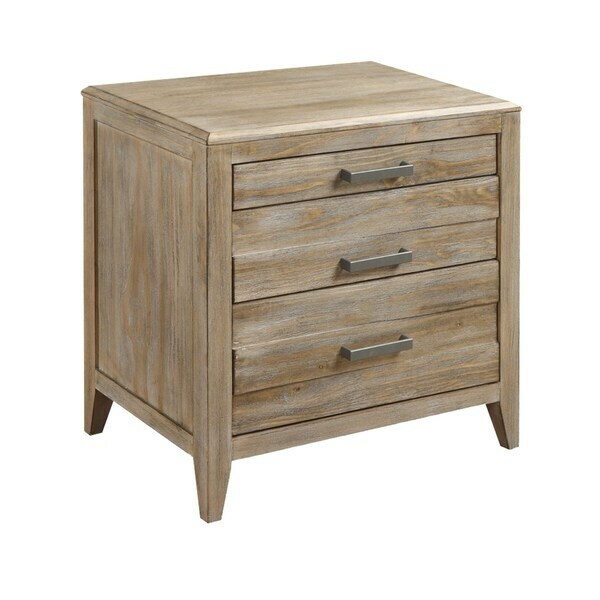 It's a solid piece that has a cool design on the front of the drawers. I also really like the fact that you're able to plug in the table for multiple ports for charging electronic devices. A really nice feature for sure. A rugged wire brushed face with lapped slats and natural steel hardware giving a feel of the rustic outdoors is brought uptown with a soft upholstered panel headboard and a natural washed grey finish with linen highlights supported by a tapered leg. Pine solids and extra thick pine veneers are deeply wire-brushed, finished in a natural sandstone and then blended with a soft linen hue. Heavy slats are lapped on the fronts of the cases adding weight and interest to this design. The hardware is a simple horizontal pull in a grey steel tone. Accessories, mattress, box spring, and bedding (comforter, sheets, pillows, etc.) pictured are NOT included. Note: This product will be shipping using inside home delivery . The product will be delivered to your door of the nearest ground-level entrance of your residence. Signature required upon delivery. Dimensions 28.0 In. X 18.0 In. X 28.0 In. This was the 3rd bedroom set we have purchased from Overstock and they have never disappointed us. 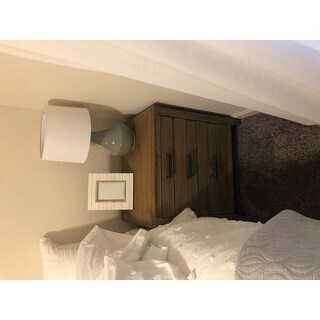 This nightstand and the matching dresser look exactly as pictured, came extremely well packaged and required very little assembly—just flip the drawer pulls. We are very happy with this purchase. I had to return this piece as it did not fit into our new apartment. However, I did note the beauty of the grain of the wood. Shipped fully assembled. Delivered by UPS. Packed extremely professionally. So sorry I couldn't keep them. Thank you Overstock! Love!! Has usb built in for charging devices, nice heavy gliding drawers. Good stuff! Sturdy piece, love it for my master room! We have the matching bed and dresser and those are great pieces. We ordered 2 nightstands and one of them arrived completely damaged and not usable. The other one was fine but not great. Overstock’s customer service took 2 emails to here back from but sent a replacement quickly after the 2nd email. Beautiful nightstand but it did arrive with a broken leg. Overstock is not as good as Wayfair with their refund policy but they did handle it fairly quickly. Finish is lovely. Hardwood is too industrial for me. It looks better in pic than in my master bedroom.It has rough surface and too bulky for my taste. I will keep them since it was sooo heavy and took a lot of work to transport them to 2nd floor, but would not have bought them if I saw them in person beforehand. "How do the drawers open? They are locked upon delivery." "Are the drawers on metal rollers and do they slide easily?"